Which Digital Camera, and Features work best for the Artist. 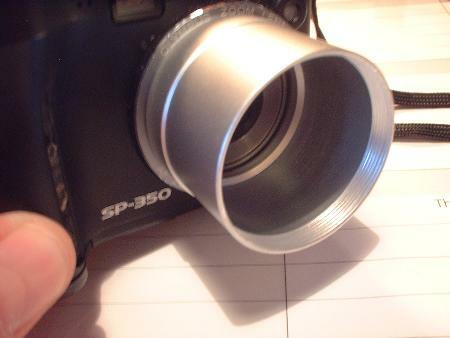 Most camera's come with a “hot shoe” for a flash attachment. They also come with a threaded hole in the bottom for a tripod attachment. I mention it here so that you make sure the one you're looking at has them. Lens adaptability. Newer models are coming less and less frequently with the ability to add a lens filter. I suppose this is another way to get you to purchase the more expensive Digital SLR camera that usually always has this capability. Let me show you exactly what I'm referring to. See the photo below? Which digital camera features are needed. 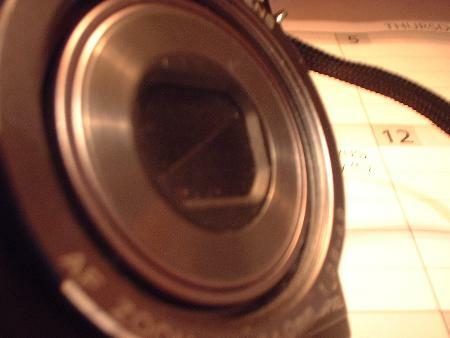 It shows the camera body with a threaded ring around the zoom lens. This is for an adapter. As you can see, I've screwed the adapter onto the camera face. What's the adapter for? It allows me to add a special filter lens to the camera. 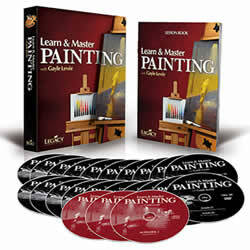 If you paint in oils (and even acrylics) the varnish you put over your completed painting is very shiny. Once the filter is mounted to your camera, a small rotation of the lens eliminates 90% of any glare coming into the camera off of the shiny bumps within your painting. 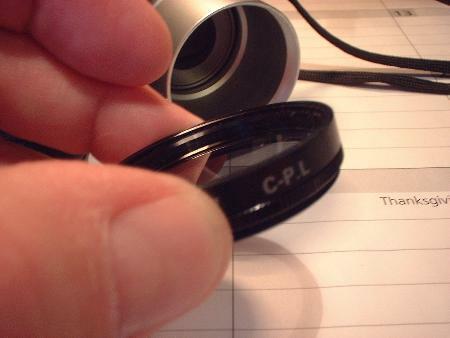 See the pictures below on how I mounted my CPL filter to the camera. You will need to look very closely at the lens on the camera you’re planning to purchase to see if there are threads near the base. This means an adapter can be screwed on, and thus a filter lens can be added. Another way to see if the camera can utilize this is to research the internet for an “adapter” and the model camera your looking at. If a lens adapter is available for the particular model, then you should be ok.
My Olympus is capable of an adapter, so I lucked out. I didn’t know this at the time when I purchased, but am glad for the functionality now. 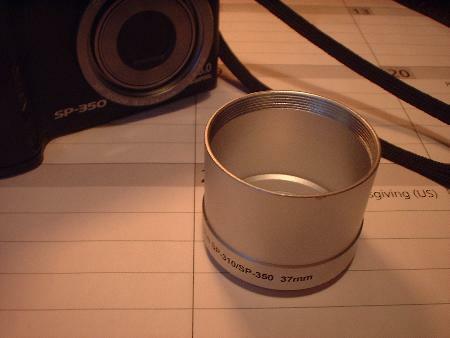 These adapters and filter lenses are also inexpensive. Mine was less than $30 combined on Ebay! So now when I shoot my work, it doesn't need a great deal of Photo-Shopping to clean up all the sparkling glare. 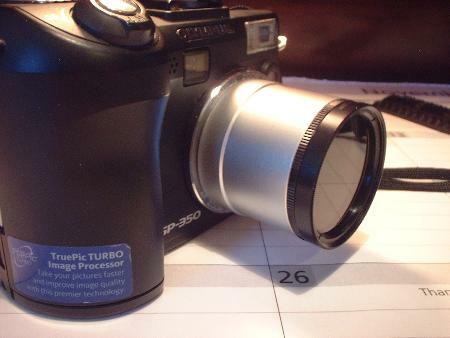 Another very important feature in deciding <i>which digital camera</i> to go for are Functions. Most have an assortment of function capabilities, but for you the artist, being able to bracket your shots is very important. Bracketing means changing the exposure times (F stop on older camera’s) to make the picture lighter or darker. Your automatic settings usually place you in the best exposure range, but just in case, take a shot that is a little darker, and then one that is a little lighter. (A shorter exposure time, then a little longer exposure time) This is what is meant by bracketing. When you view your pictures later, you then can decide which shows the best details both in fully lit areas, and in shadow areas. Too dark, the shadow details disappear. Too light, the well lit areas details disappear. 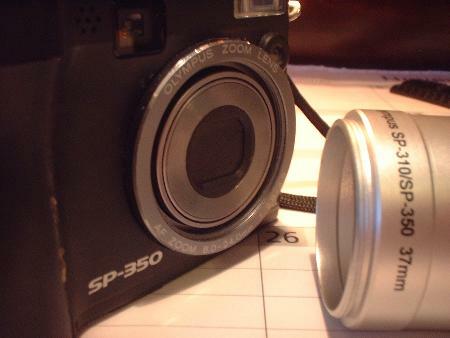 So, you now have a great start in deciding which digital camera to purchase. Or at least which features will be needed to get your best pictures. Back to the top of "which digital camera features" you need as an artist. Back to Part 1 of choosing a digital camera, and choosing a digital camera for the artist.